Monika Sosnowska creates ambitious architectonic structures and site-specific installations, which simultaneously embrace and resist the spaces they occupy, as well as respond to the social, political, and psychological use of space. Her vocabulary echoes varied and contradictory modernisms: that of 1930s Polish constructivism, the minimal and conceptual tendencies from the 1960s and 1970s, and the socialist architecture found in former Eastern European states. For her Glasgow International exhibition, Sosnowska will present sculptural works inspired by the Polish housing development Osiedle Slowackiego in Lublin, which was designed by the architect and artist Oskar Hansen in the early 1960s. The estate was based on ideas developed by Hansen’s revolutionary Open Form philosophy, a concept that could be construed sociologically as a spatial structure shaped by various types of human activities. The philosophy embraced art-as-process and had a focus on engaging and involving the viewer, recipient and user. Hansen’s subsequent theoretical programme, the Linear Continuous System, transposed the concept of Open Form onto larger scale urban and spatial planning. Sosnowska’s central piece occupies the Aird’s Lane gallery space, a large-scale, distorted replica of a fragment of the structural steel framework from the shopping pavilion located within the Osiedle Slowackiego estate. The original pavilion was based on Hansen’s notion to reveal the structure of the building – where the steel framework was exposed within the building’s interior. Such a technique was characteristic of his Open Form concept – the basis of this aesthetic was to show the tensions that occur within the construction of a building. Revealing such tensions are central to Sosnowska’s sculptural language, and are further manipulated within this replicated form as it twists and contorts the original motif into a disorientating configuration, squeezed into the gallery space. 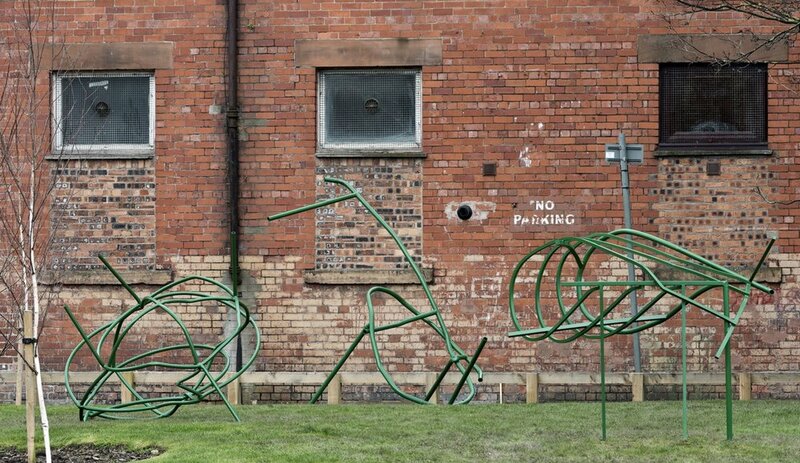 Utilising the green-space outside the gallery four sculptural pieces take the form of a balustrade and structures from the playground within the original housing development – further illustrating the fragmental forms which made up a once utopian scheme for progressive urban living. Sosnowska’s works are both expressive illusory constructions – as well as structures that retain a partial memory of the architecture of postwar modernism. Throughout her practice, Sosnowska has drawn extensively on examples of Poland’s modernist architecture and basic architectural elements, such as developments by Oskar Hansen, Jerzy Sołtan and Jerzy Hryniewiecki, as well as the realisations, design principals and ideals of Mies van der Rohe, Walter Gropius and Le Corbusier. Leading to the production of significant works including: Façade (2013); Tower (2014); Stairway (2010); 1:1 (shown in the 2007 Polish Pavilion at the Venice Biennale); and Corridor (2006). For over a decade, Sosnowska has collected visual material, accumulating an archive of photographs taken on walks around her native Warsaw, documenting the city’s changing architectural landscape. Observing the conditions of everyday life in Poland, Sosnowska focuses on architectural details and structures found within tower blocks, factories, workshops, demolition sites, housing estates, marketplace stalls, public sites – abandoned and neglected places, which serve as tangible reflections of the country’s Communist past. Often beginning her artistic process with the creation of maquettes and drawings which quote from existing forms – Sosnowska’s fabricated replicas are reproduced at 1:1 scale, often using the same materials and colours from their archetypes. Sosnowska manipulates their form and deprives them of their original function – forcing them to bend, collapse, invert and distort – resulting in configurations that not only alter our perceptions of physical space, but also challenge our certainties about memory and assumptions about societal structures.